Various publications and articles have widely documented the U.S. hotel sales’ slump that occurred in 2009, noting also that the number of lodging transactions increased substantially in 2010. The average price per guest room in Hotel & Leisure Advisors’ database of hotel sales increased by 60.9% from $90,326 in ’09 to $145,348 in ’10. The following commentary breaks down and analyzes average sale prices by property type, highlighting a wide disparity between the average per room sale price of lower-tier hotels in H&LA’s database (which have declined between 2009 and 2010) and upper-tier hotels (which have increased between 2009 and 2010). Hotel & Leisure Advisors maintains a database of over 5,000 U.S. hotel sales that transferred between 2000 and the present. Our firm obtained sale price information for and further researched 431 sales that occurred in 2009 and 2010. I omitted sales of casino hotels as these properties transferred at significantly higher prices due to their inclusion of casino-related revenue. I then utilized the industry-accepted Chain Scales developed and defined by Smith Travel Research (STR) to sort and analyze the sales by property type. A complete list of the 2011 Smith Travel Research U.S. Chain Scales is available from STR via the website www.strglobal.com under the Resources tab. The following table depicts H&LA’s database of 431 average U.S. hotel sale prices per room broken down by STR Chain Scale. The sales are further grouped by years 2009 and 2010. H&LA’s 2010 sales database included 103 more sales than occurred in 2009 – a substantial increase in transactions year over year. The range of per-room sale prices was expansive among all seven property types. Though the overall increase in average sale price per room as well as transaction volume signifies improvement in economic conditions, the inconsistency among various property types requires further analysis. The following table shows the percentage change between 2009 and 2010 of the 431 sales broken down by Chain Scale. 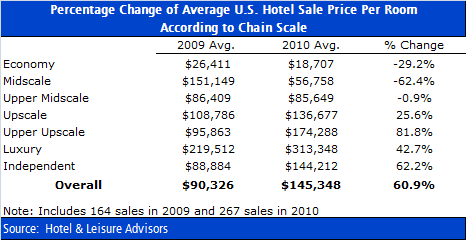 After sorting the sales and comparing the average price by Chain Scale for 2010 versus 2009, the result brings to mind the cliché “the rich got richer, while the poor got poorer.” In 2010, average per room prices for Economy hotels (including brands such as Days Inn and Motel 6) and Midscale hotels (including brands such as Baymont Inns & Suites and Quality Inn) decreased substantially, while average prices for Upscale hotels (including brands such as Doubletree and Residence Inn), Upper Upscale (including brands such as Hyatt and Westin), and Luxury hotels (including brands such as InterContinental and Four Seasons) enjoyed a considerable uptick. The Independent properties’ per room sale prices also increased significantly, though this category includes myriad property types from small, budget-oriented motels to large oceanfront resorts, making direct comparison difficult. 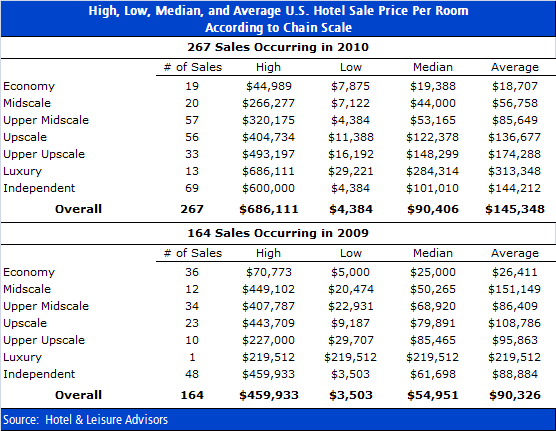 It’s easy to calculate that the average price per guest room in H&LA’s database increased by 60.9% from 2009 to 2010. The harder part to decipher is why the average per room sale price of Midscale properties dropped by a whopping -62.4%, while the average per room sale price of Upper Upscale hotels increased by 81.8%. The simple answer: different balance sheets and different buyers. 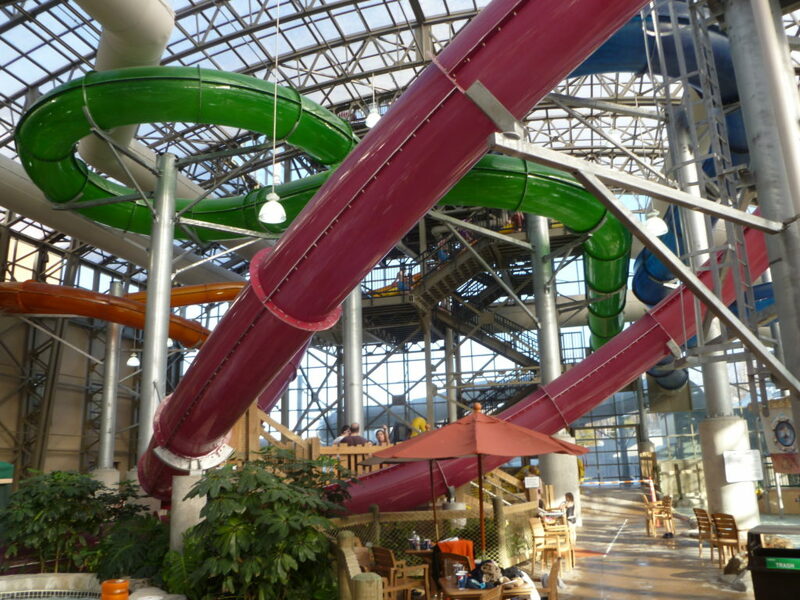 Distressed sales of several underperforming Midscale assets pulled average prices down, as buyers demanded deep discounts for hotels that were losing money. Additionally, there were 67% more Midscale hotel transactions in 2010 over 2009, indicating that an increase in transaction volume doesn’t necessarily yield an increase in sale price. The typical buyers of these lower-tier hotels in 2010 were individual investors, many representing owner operators buying properties out of receivership from banks. Laurel A. Keller is a Senior Associate with Hotel & Leisure Advisors, a national hospitality consulting firm. Ms. Keller has been a hospitality consultant and appraiser since 2001; she holds a Certified Real Estate Appraiser’s License in the state of Ohio, and is an Associate Member of the Appraisal Institute. She earned a Bachelor of Science degree in Hospitality Management from Purdue University, and worked in management and sales positions with country clubs and hotels prior to launching her hospitality consulting career. 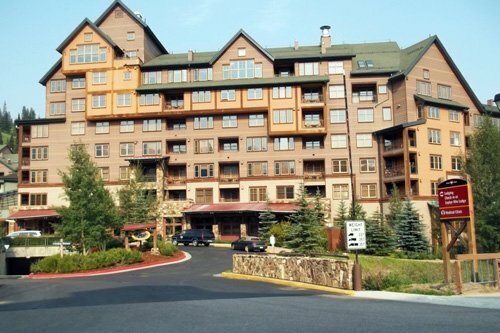 Ms. Keller has performed appraisals, feasibility studies, operational reviews, impact analyses, and economic impact studies for resorts and hotels, ski areas, golf courses, country clubs, indoor and outdoor waterparks, timeshare, fractional, and whole-ownership condominium developments, restaurants, and other leisure- and hospitality-oriented commercial assets in 30 states.